Wow, it's been an exciting year in the precious metals markets so far! I'm sure you've seen the big moves up in all the metals and the recent confirmation of a new bull market on the heels of the frustrating cyclical bear market of the past 5 years. We expect this new uptrend will eventually take gold and silver above the 2011 highs as the long-term secular bull market in the monetary metals resumes. 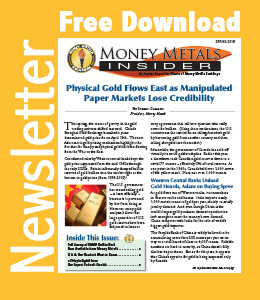 Given all the fireworks, it's especially vital you read the Spring 2016 Money Metals Insider newsletter – which is now available to you TOTALLY FREE! Don't miss the important article about the Shanghai Gold Exchange and the flow of gold out of the West and into Asia. This is a mega trend that has HUGE long-term implications for the metals and for the purchasing power of the dollar. Gold goes where it is most adored, and the financial establishment in U.S. and Europe has treated the yellow metal with such little respect in recent decades. This is now coming back to bite us. So download the free PDF of this fantastic newsletter right now and even pass it around to your friends! It's just another free benefit for those who have signed up for the Money Metals email list.